Learn how to order clickers and provide registration instructions in your syllabus. This website is designed to train you in using clickers for your class. To receive an instructor kit, as well as personalized training if desired, contact ETS. In order to assure that clickers are on the shelves for the first day of class, instructors should place an order with the UC San Diego Bookstore no later than 1 to 2 weeks prior to the beginning of each quarter. Same day requests can be accommodated, depending on stock at hand. Clickers are available adjacent to the textbook info counter in the Bookstore, or can be purchased new or used online. (When used clickers are purchased, if the instructor does not use TritonEd the student will need to pay iClicker a used-clicker registration fee). Students may sell their used clicker back to the Bookstore if the Bookstore needs extras, which is usually the case. Although most students already have registered clickers, we suggest that you put clear instructions in your syllabus about a deadline for students to register their clickers and an explanation of how to do this. On your homepage you will see a window titled "iClicker Remote ID Registration." 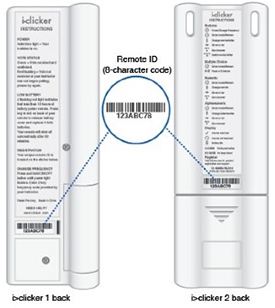 Enter the ID letters and numbers found on the back of your iClicker remote just under the bar code. Students can get information about creating a REEF account and registering for a class from this iClicker support article.